April is the season of showers. You know, the kinds that bring May flowers. While wet may be the order of the day this time of year, we’re going to turn our attention to a drier topic, specifically to the kind of dryer found in your home that you use to get newly washed clothes ready for wearing. 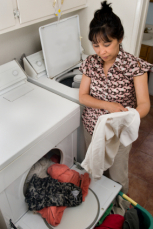 Clothes dryers are one of the most commonly used household appliances, and one of the most dangerous. The latest report from the U.S. Fire Administration reveals that clothes dryer fires cause some $35 million in property damages each year and account for as many as 5 deaths and 100 injuries. What’s the leading factor in these deadly and costly dryer fires? “Failure to clean” tops the report’s list of causes, because it’s often lint and other buildup that spark the flames. And what’s as troubling as any of the numbers we’ve just shared is the statistic that only half of reported clothes dryer fires are contained to the units themselves. That means 50 percent of clothes dryer fires spread to cause damage to other parts of a home or property. One sure fire way to help reduce your risk is an annual inspection of your home’s dryer exhaust vents. Our Chimney Safety Institute of America certification for dryer exhaust technicians is the only nationally recognized program for training industry professionals on the kinds of best practices that can help keep your family and home safer. Annual inspections are all the more important in newer homes that often position clothes dryers in inner rooms, which requires longer venting duct work that could facilitate the buildup of fire threats like lint and dust. Finding a certified dryer vent technician in your community is easy at csia.org/search.